Caliburn pods are replacement vape pods for the Uwell Caliburn pod system that deliver a satisfying MTL hit every time. A magnetic base connection makes Caliburn pods a "snap" to use and maintains a strong connection between pod and device, abating any chance that your pod will fall out. To fill a Caliburn pod, simply remove the top mouthpiece cap and squeeze your favorite juice in. Pods can hold up to 2ml of e-liquid and come in packs of 4. The Caliburn by Uwell is a lightweight refillable pod kit which fits perfectly in your palm and only weighs 1.0oz! This slim pod has a 520mAh battery and can be draw activated as well as manually activated with the fire button. Lock and unlock the Caliburn by clicking the fire button 5 times and charge with the included micro USB cable. Each refillable Caliburn Pod has a 2ml nic salt juice capacity that will give you satisfying MTL hits perfectly. Each pod has a magnetic connection at its bottom to make snapping you pods into place easier than ever. The top fill design makes refilling your pods easy and mess free, and LED indicator lights alerts you to low battery with a green, blue, or red light. The Caliburn is perfect for beginners who want a lightweight pod mod that you can take with you anywhere! 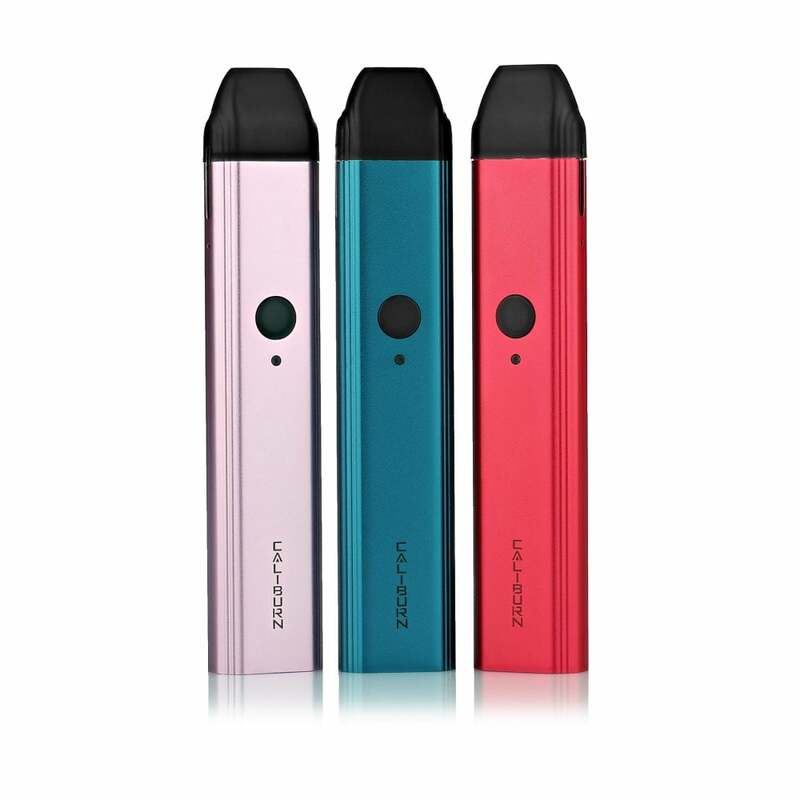 This is the best pod device I have used I have several juuls and was sick and tired of buying pods I felt like it was a waste since the pod prices are becoming outrageous. The and a bottle of juice is so much better than a juul. Buy it! 21st April 2019 - James W.
Remarkable flavor! I had a few juices that I thought tasted bland and had set aside but with the Caliburn I can actually taste them now. I’ve been using my Uwell Calburn for about 2 days now and I absolutely love it. It’s a smooth vape every time, zero leaking, and the auto draw feature along with the option to manually press the button to draw is a great feature. I can’t be the only one who uses a variety of different pod mods and sometimes hits a manual button firing device as if it’s an auto draw device and nothing happens, can I? I am more than pleased with the performance of the Calburn, and I cannot believe how incredibly better the Nic Salt flavors are with the Calburn’s flavor coils. It’s the best pod vape for flavor that I own, and the ramp up time on the draw is instant, which makes it superior to any other draw activated pod mod I have. The battery life could be better, especially since the wattage is not fixed and decreases with the battery charge, but since I have my Nord, Lost Vape Orion and a Mico as back up devices, that’s not a problem. Those who are not heavy vapers can easily get through a whole day without needing to recharge the Calburn. It’s a 5 click on/off device so you can turn it off to carry it in your pocket without it auto firing. The spare pod in my kit was cracked, so if you experience any leaking, check the pod for cracks. I don’t know if mine was damaged in shipping or if it was a manufacturing defect. The pod that came loaded in the battery is completely leak free. The Calburn pods are also supposed to have a longer life, and I have filled the one I’m vaping now about 4 times so far and there’s not a hint of burnt coils and zero dry hits. I do refill it when it’s about half empty to make sure the coil stays saturated so I don’t have any dry hits. The draw on the Calburn is loose and airy, similar to the Nord or Breeze 2, and there’s no way to adjust the air flow, so if you prefer a tight draw like a Juul or Sourin Drop has, then you may not like the loose draw on the Calburn. Otherwise, it’s an excellent device and it lives up to the praise it has received in reviews. It’s my favorite pod system so far and I am very impressed with its performance. I just can’t believe how incredible the flavor of my Nic Salts comes through on the Calburn compared to all the other pod mods I’ve tried in the year since I switched from smoking cigarettes to vaping. It’s an all around WINNER for sure!